How my quest for a natural beard dye meant I had to create it. Don’t get me wrong, a beard with a bit of grey can look great for some silver daddies. But for me, a fuller, darker, sharper looking beard is the way I like to go. When I started to see more grey in my beard “a few years back,” I headed down to my local store to pick up what was at the time the best (and only) beard dye available. There were lots of warnings on the box, so I took precautions. To be on the safe side, I chose to pre-moisturise my skin under my face to create a natural barrier between the dye and my skin. At first the beard dye was great! It went on easily and did the trick. Not too many months after, I started to develop a severe and persistent itch that drove me crazy. And it didn’t stop there. I eventually sported red welt marks on my face at times, and even hives, scales and weeping burns – not pretty. I took lengthy breaks between applications and fortified myself with antihistamines to prevent breaking out. But it got worse, so I got a doctor-prescribed topical lotion (Elecon) to counteract contact dermatitis, coupled with a pain deadening cream to make the itching comfortable enough to be able to work and sleep. The combination of moisturisers, oral and topical antihistamines, and pain deadening cream worked for the most part to mitigate an allergic response But if my immune system wasn’t up to snuff because I was tired or stressed, it didn’t matter: the allergic reaction from the dye was back, and was worse. All for some beard colour. What a price to pay! I am an accomplished athlete and have been involved in health, fitness and wellbeing most of my life (My passions!) The last thing I want to do is injure my skin with harsh chemicals. It is so counterproductive to everything I believe in. I started looking for natural beard dyes and alternatives. I found one and I started working with it, but after a short time they decided to retract their business and do something else. Essentially, I was back at square one. As an entrepreneur, I had already developed several unique high-quality products. So, I set out to develop my own natural alternative. At least I would know what was in it! I was told I would never be successful until my natural dye could mimic the results of a chemical dye. The technology was a difficult process. After four long years, several failed attempts, and help from lots of people, we finally perfected a smart, natural dye that is easy to apply, requires no mixing, gives instant results, nourishes the beard and the skin, and looks beautifully natural. I started using it, and so did other guys in my life, and the rest is history as they say. 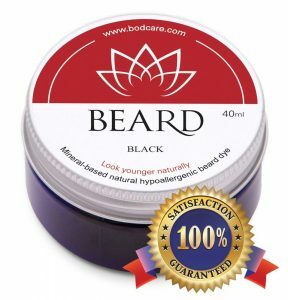 This product has given me the confidence and control to sport a younger looking beard – naturally. I hope it gives you the same!